Did you know that the 8-1/2"x11" velvet-like paper sold at Ben Franklin Crafts can be embossed with an iron and a rubber stamp? Years ago I saw (on the Carol Duval craft show) velveteen fabric being embossed by ironing it over a rubber stamp. To use this technique for paper place the rubber stamp (rubber side up) on the table and spray both sides of the paper with water. Place the fuzzy side of the paper on the rubber stamp and press a moderately hot iron onto it without sliding. It's the frosting on the (cup)cake when someone (like Kristen) likes my projects enough to use the ideas in her own work. Crafters inspiring other crafters is how our work will evolve. One of my art teachers told me that even the masters looked to past art for inspiration. Anyone reading this blog is welcome to the ideas and I hope that you will show me your work too. The following is the frosting recipe I used for the gigantic cupcake. I reduced the recipe so that it makes just enough for the cupcake. I think it tastes better than the can frosting. Cook milk and flour in a saucepan over low heat until it thickens. Cool the mixture completely. Beat butter and sugar in a bowl. Add the cooled flour misture and stir until smooth. Add the vanilla. These photos here are a preview of one of the Valentine cards that will be a project in the online newsletter.........coming soon! 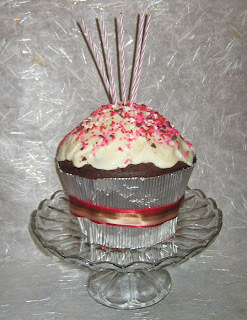 Yesterday was my sweet cupcake's (husband/best friend) birthday. Being short on gift ideas, I was happy to find the Art Blanche chipboard cupcake blank album at Ben Franklin Crafts (where else?). I decided that this five chipboard page undecorated album would make a good photo card mini-album. Using mostly paper from DCVW (Sweet Stack 4x6 and Glitter Stack 4x6), I easily traced the parts for the cupcake liners (to cover front and back of each page). To do the candles I used Stickles glitter glue (yellow and orange) for the flame and assorted scrap papers for the candles. For the frosting I found that plain white glue and pastel glitters (Martha Stewart or Doodlebug) gave the right sparkle. 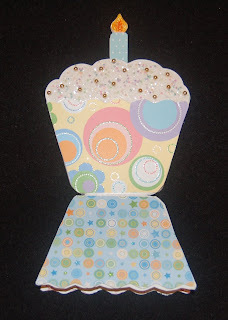 I added Bits and Pieces small gold beads and pastel seed beads to the front cupcake for a more dimensional look. The paper for the front of the card was from Imaginisce and it was crimped (before cutting it out) to give it a realistic baking cup look. 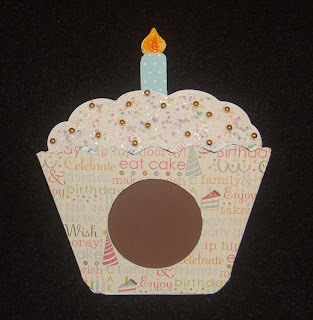 I used Merikan double stick tape on only the sides and bottom of the cupcake liner pieces so that a pocket is formed on each page for storing photos or memorbilia from birthday celebrations. I intend to decorate the pages further with photos and captions. The only difficult part of making this card/album was waiting for the Stickles to dry (overnight) so that I could work on the next page. Thank you to Kristen for reading and commenting on my blog. It is really good for my ego to know that there are readers out there who are enjoying what I write. Right now I am working on our first online newsletter and Valentine's Day projects, so I hope that you'll come back to see what's new. When I purchase a rubber stamp, it is usually because it has a nice graphic design. Recently, while at Craft in the City (downtown Honolulu on Bishop Street) I bought this three birds rubber stamp (Hero Arts) because it had a child-like quality. I left it on my desk for a week or so while I thought of how to use it. In my stash of undecorated cards and envelopes, I spied a long, bright turquoise card by Making Memories. I don't think we have this polka dot set any more for sale at BFC, but the design is so simple I'm sure you can make it. 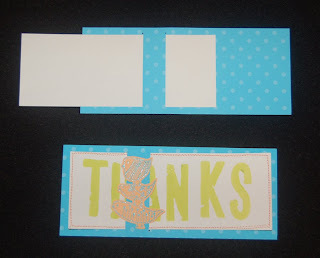 The envelope is 9-1/2"x 4-1/4"and the blue polka dot card is 9-1/4"x 4". The white paper that slips into the polka dot one is 8-1/2"x 3-1/4". The two slits in the polka dot paper are 3-3/8" long and one inch apart. I began the card by stamping the word 'THANKS' using 2-1/2"letters (Making Memories) and yellow green paper paint (Making Memories). Next I stamped the bird design on salmon colored cardstock paper using turquoise ink (Versa Magic). Before the ink dried I sprinkled on turquoise embossing powder and melted it with my heat gun. (If you don't have turquoise embossing powder you can just use clear embossing powder over the turquoise ink.) I cut around the design and taped it (with Merikan double stick) to the 1" panel between the slits. Finally, I used my mini craft sewing machine and orange thread to sew around (twice) the edge of the white card. Rarely does my finished project match or exceed my imagination. I think this project really looks better than the card I had in mind. Don't worry if your craft work does not have every stitch in place and keep playing with colors, sizes, shapes, etc. until YOU are pleased....then it will be perfect! Have you written all your thank you cards? Have you made any? Time to start crafting your cards if you haven't done them yet. Here is a sample of the type of cards I made for my thank you notes to all my great family and friends who thought of me this Christmas. 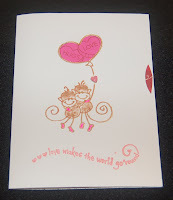 I started making the card by stamping Hero Arts Japanese doll designs on a piece of thin wood ( I purchased a sheet from BFC) with Versafine black ink. Then I colored in the design with glaze pens (Sakura) and cut out the dolls. I first traced the dolls with a craft knife and then cut out the wood with a scissors so that the wood wouldn't splinter. 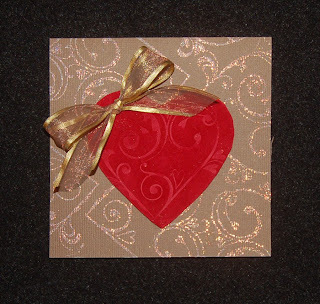 You could use tan cardstock if you cannot find a thin wood sheet. Next I coated the front of the dolls with a dimensional glaze (Plaid) and let them dry on a non-stick surface. I stamped the words on torn piece of mulberry paper (Mountain Idea). I put the card together with Merikan tape, gluing the dolls down with Fabritac glue. 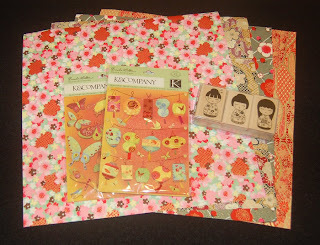 K and Co. lanterns or butterfly dimensional stickers also look good with the Japanese dolls. I've recovered from the holidays. Ready to begin crafting again? I traveled to Honolulu for a short trip and had the opportunity to visit the new Crafts in the City store. The small store on Bishop Street is a well-supplied modest space. Shown in the photo are some items that I purchased from Crafts in the City. I plan to use them to make New Year/ Thank you cards. 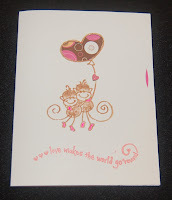 There were many 12x12 washi papers and Asian themed rubber stamps by Hero Arts. The K and Co. dimensional stickers are perfect embellishments for cards or New Year scrapbook pages. Most of the other Ben Franklin Crafts stores will have these items and I will post photos of the projects I make with them.